Teen Crashes into Florida Highway Patrol Trooper in Lantana | Schuler, Halvorson, Weisser, Zoeller & Overbeck P.A. 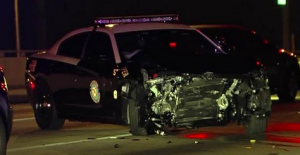 A Lake Worth teenager crashed into a Florida Highway Patrol car on Lantana Road near Interstate 95, authorities said. He sustained minor injuries and was taken to the JFK Medical Center in Atlantis, FHP said. The trooper, Guilherme Maia, 43, of Lake Worth, also sustained some injuries and was taken to JFK for treatment. The car sustained significant front end damage, but FHP spokesman Mark Wysocky said. According to FHP, the crash occurred when the young driver attempted to merge onto I-95, but took a wide left turn and struck the front of Trooper Guilherme Maia’s vehicle. The teenager was driving eastbound on Lantana Road and began to turn left to enter Interstate 95. Maia was westbound in his FHP cruiser, and the teen “did not negotiate a proper left turn, went wide” and hit Maia’s vehicle, causing significant damage to its front end. The teenager was arrested after being medically cleared. He was arrested for possession of drugs and drug paraphernalia following the wreck. He sustained minor injuries and was taken to the Palm Beach County Jail after being medically cleared at JFK Medical Center in Atlantis, FHP said. This is a vehicle crash with injuries, according to FHP crash report. It has led to a delay in traffic. Vehicles on this route are pulling to the roadside to allow emergency service crews work. Some are pulling into nearby side streets. The delay of traffic on this route is due to the severity of the crash. It is best to use alternative routes such as Hypoluxo Road and S Congress Avenue. West Palm Beach attorney Jason Weisser of Schuler, Halvorson, Weisser, Zoeller and Overbeck responded about the crash. “It has been reported that the teen driver was imparred and caused this accident in Lantana. It appears that the injuries required medical attention but they were not life threatening. All involved are very lucky because the results could have been much work. Unfortunately in our practice, we have seen numerous instances where drivers blatantly violate the law, which results in catastrophic consequences. If you have been in an accident, please make sure that you contact an experienced trial lawyer to represent you and your family”. The post Teen Crashes into Florida Highway Patrol Trooper in Lantana appeared first on Traffic Center.